Sheffield United were beaten by two late goals at Gillingham as their play-off hopes suffered another blow. Che Adams started today’s League One fixture against Gillingham who unveiled Justin Edinburgh as their new manager before kick-off. The former Tottenham Hotspur defender was scheduled to watch the match in an observary role before taking charge of first team affairs tomorrow. Ben Davies, Louis Reed and Paul Coutts also featured for the visitors who elected not to call upon new signing Matt Done. The striker is nursing a slight ankle complaint. Michael Doyle, the Sheffield United captain, warned the visitors would have to stand-up and be counted at the Priestfield Stadium. Gillingham might be languishing towards the wrong end of the League One table but, as their midfield general acknowledged, still pack an almighty physical punch. 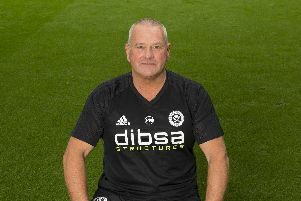 In the event Doyle was ommited from the starting eleven as Nigel Clough attempted to steer safe passage through a particularly congested fixture schedule. Nevertheless Gillingham, who confirmed Justin Edinburgh as their new manager during a news conference two hours before kick-off, lived-up to type with Cody McDonald thundering into a fifth minute challenge on Jay McEveley after Louis Reed had sold his stand-in captain short before Bradley Dack launched the first of several high balls into Mark Howard’s six yard box. Basham also had to be brave when another pass from United’s midfield fell short but, like his fellow centre-half,proved equal to the task. United’s defence was angered when John Marquis caught Howard with an accidental boot soon after but the goalkeeper, who had every right to be challenged by the Gillingham forward, recovered. Paul Coutts showed good composure to instigate a sweeping 13th minute move which ended with Jamie Murphy being flagged offside. But, for the most part, both teams indulged themselves in a battle of will rather than wit. United had made the journey south in sixth place following last weekend’s victory over then leaders Swindon Town but accused of going down with a whimper during Tuesday’s defeat by Preston North End in the FA Cup. Coutts and John Brayford were both recalled after being forced to sit-out the fourth round replay against Simon Grayson’s side but was Murphy who led the charge, during the early exchanges at least, here. The former Scotland under-21 international caused Gillingham’s rearguard plenty of problems with his turn of pace and drew the 15th minute free-kick from Max Ehmer which allowed Ben Davies to deliver a dangerous centre into the hosts’ penalty area. Stuart Nelson, the Gillingham goalkeeper, appeared anxious under pressure whenever United gave Gillingham a taste of their own medicine but, after Brayford had seen a shot scrambled off the line by Hessenthaler, redeemed himself by pushing a low drive from Adams around the foot of the far post. Those two incidents, in the 20th and 22nd minutes, appeared to mark the moment United took charge of this game. Gillingham had their moments - most notably a Bradley Dack free-kick which blazed into the wall - but, for the most part, the action now ebbed towards Nelson rather than Howard. A misunderstanding between Reed and Adams saw one promising counter-attack, towards The Rainham End, break down just past the half-hour mark. Marquis was cautioned in the 35th for deliberately catching Bob Harris with his studs. Then, three minutes later, Brayford found Reed inside the area but Nelson did well to save the young midfielder’s shot. He had to because Murphy, stood almost on his fingertips, was poised and ready to pounce. A minute before the interval, Josh Pritchard pulled up lame which forced Gillingham to make their first change. Danny Galbraith entered the fray. United emerged unchanged for the start of the second period with Basham, his head wrapped in bandages, immediately going close and Dack fortunate to escape a caution for a clumsy tackle on Davies. As the hour approached, the visitors began to dominate possession. Murphy had a shot charged down soon after Davies and Brayford had combined to nearly prise apart Gillingham’s back four. But, in the 57th minute, only the width of the crossbar prevented Gillingham from taking the lead. Hessenthaler swept a looping ball into the area and McDonald, left unmarked, helped it towards goal for what looked set to be a memorable finish until the woodwork intervened. It prompted arguably their best spell of the game so far so, in the 62nd minute, United introduced Jamal Campbell-Ryce at the expense of Davies in an attempt to change the dynamic. Dack diverted Gavin Hoye’s centre widein the 67th minute as Gillingham began - just - to begin really stretching United out wide. Jason Holt, signed on loan from Heart of Midlothian, made his debut for the visitors after replacing a visibly tired Baxter with 14 minutes remaining. Marquis made way for Jermaine McGlashan soon after. Then, in the 87th minute, Gillingham took the lead. Max Ehmer launched a long ball forward over the top of United’s back four and McGLASHAN rolled home beyond Howard who had come dashing out of his area. Then, deep into stoppage time as United threw men forward in search of an equaliser, McDONALD hit them on the break for the second. GILLINGHAM: Nelson, Garmston, Egan, Ehmer, Loft, Hessenthaler, Marquis, McDonald, Pritchard, Dack, Hoyte. Substitutes: Legge, McGlashan, Morris, Galbraith, German, Norris, Dickenson. SHEFFIELD UNITED: Howard, Harris, Brayford, Basham, Murphy, Baxter, Davies, Coutts, McEveley, Reed, Adams. Substitutes: Doyle, McNulty, Campbell-Ryce, Turner, Freeman, Kennedy, Holt.